Why oh why oh why would I want to go to The Netherlands? The bestest everest place I have ever ridden a motorcycle so far has to be The Scottish Highlands with its quiet roads, amazing corners and bends, stunning scenery and endless space. The most beautiful place I have visited so far, only just pipping Scotland's beauty, is The Alps. You'll notice that these 2 places have one thing in common, mountains. The name for The Netherlands comes from the word "nether" or low so Netherlands translates to Lowlands. The Netherlands is famous for distinctly lacking in mountains. In fact a little research suggests it hardly even manages a hill, according to Wikipedia the highest point is in Vaalserberg at a staggering 322.7 meters above sea level. This...this is about as close to a hill as it gets in The Netherlands. A typical Dutch dyke. Also according to Wiki The Netherlands is the most populous country in Europe (most people per square mile/kilometre etc) so it seems unlikely to provide a wild and remote experience far from the madding crowds. While I understand it's actually nonsense I like to pretend I'm a wild explorer of long lost or undiscovered lands, that's not going to happen in The Netherlands is it. If you Google images of Dutch scenery you will be presented with various mixes of 4 things - windmills, narrow houses, vast fields of flowers and canals. I am not particularly a big fan of windmills, houses or tulips, however having watched endless tv programs about the industrial revolution I can at least appreciate a canal. So there's no compelling reason for me to go to The Netherlands is there. Well...there is one thing. On my previous sojourns I have met several Dutch folk and one thing struck me about them all, how friendly and warm they are. Older ladies sharing their tea with me in Germany, the carpenter with massive strong yet gentle hands in The Alps, the chatty campervan man in France and the old cyclist in Belgium. They all seem to be at ease with themselves, their egos and the world around them. I would like to meet the people in their own country. I want to answer the question, are the Dutch friendly? There's nothing worse than arriving at a campsite in the cold wet rain, spending an hour pitching the tent and setting everything up then having to get back on the soggy bike, ride into a town you don't know, find a shop that's open and try to buy something to eat. I just want to make a piping hot brew and stuff my face. As such I like to have something to eat with me. Tins and cartons can be squished in amongst clothes and tent pegs but bread or tasty cakes need to remain uncompressed. I've tried bags on the back seat but these require bungees and bungees squish bread. I need a box. I spent an age fishing through ebay for suitable containers, nothing was quite right. I spent aeons surfing for boxes but they're all too big, too small, to wide or too thin, too heavy or too flimsy and so on. I...I need to make my own. I can do it. I can. I know I can. I think. I am not a craftsman so sure enough my box turns out to be another one of Ren's hack jobs without a straight edge or square corner in sight. However - as a functional box it works. With the addition of an old bungee it appears to be acceptably secure too. One day, just one day I will create something more than just "functional"
Sharon has a brand new Z250SL and I have my new CB500X. These are the obvious machines to take, surely? Well...yes...and no. Sharon's only owned the 250 a handful of weeks and not even put 1,000 miles on the clock yet. She's not built up the confidence that only comes with sheer experience and practice. With almost 21,000 miles on her Keeway RKS125 she does feel much more at home on that bike. If Sharon's taking her 125 it seems pointless me taking my 500cc behemoth and expecting her to thrash her engine into oblivion. My poor old CBF125 is getting on now and that does cause me concern. At some point even with the best will in the world the motor or some other necessary component must expire and with each extra mile that time must surely be getting closer. We both have European recovery, it's not something either of us wish to use though. My overriding reason for taking the CBF125 to The Netherlands is to prove to myself and anyone else willing to listen that it can be done and done well. I know that C90s and many other small capacity motorcycles have crossed continents and circumnavigated the globe yet I, myself, Ren, wishes to do at least one proper trip on my own 125 to another country. I suspect this may be the last trip for this particular 125 as at 53,000 miles it is getting tired. Any fool can ride a large capacity motorcycle around The Netherlands. It takes a special kind of fool to ride a 125 around The Netherlands. As ready as we're ever going to be. Lets ride! We have a ferry booked from Harwich to The Hook Of Holland on Friday 10 June, a return ferry on Friday 24 June and a Travelodge booked near Ipswich on the 24th as the ferry returns late and we'll probably not want to find a campsite and make camp at an ungodly hour. Other than that there are no real plans. In the weeks leading up to our trip both bikes are thoroughly serviced, new chains and sprockets are fitted, new brake pads and shoes, new tyres and everything is double checked. I, we are as prepared as we know how to be yet I am still left doubting. 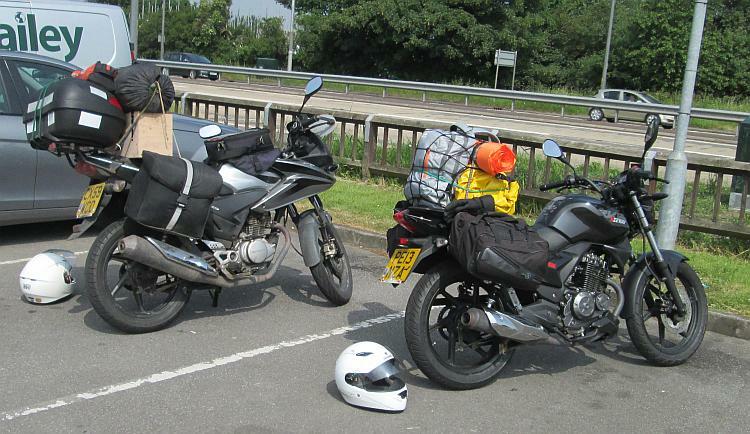 A rusty 53,000 mile Honda 125 and a 21,000 mile 125 Chinese motorcycle, probably 1,000 to 1,500 miles, 16 nights away, a dubious box, too much luggage, one rider who's never ridden on the wrong side of the road, another rider who still can't get his head around riding on the wrong side of the road and all this in a country we know very little about. What can possibly go wrong? That's our ship that is. Come on sweetie, best get our passports out. And the greatest quote ever " it takes a special fool "
Yes tell the young chap that any motorcycle is a touring motorcycle. If he's a youth then he'll do Facebook so tell him to look up Ed March. He's funny and is travelling The Americas on a very very worn out C90 Cub. Many folks use bicycles with much success so there is no excuse. Beautiful place, driven from France to Southern Spain a few times and the first time I passed through was in winter. The peaks were heavy with snow and the sun was splitting the heavens. Stopped for half an hour to soak in the splendor before carrying on home. The second time was around 2 am, again winter, 60 knot winds and heavy sleet, was fine on the North side of the tunnel Didn't do any soaking, just carried on driving at around 10 mph till I was below the snow line and visibility improved then slept for a couple of hours. I want to go back some time in the spring. See if the snow is as good as down south where I live.